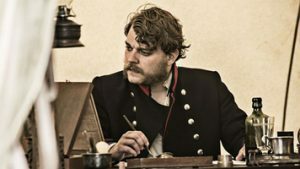 1864: Danish drama series with English subtitles. Denmark's war. Two brothers; Laust and Peter grow up under poor but happy in the Danish countryside. Both boys fall in love with the adorable Inge, a local Proprietor s daughter, who in turns loves Peter for his sensitivity and intellect, and Laust for his strength and drive. Following victories in the First Schleswig-Holstein War of 1848-50, where Denmark defeated a rebel army that fought for independence , Danish political forces are scheming to annex Schleswig into the Danish Kingdom in utter disregard of a treaty signed with the major powers of Europe, sparking a Second Schleswig-Holstein War. 150 years later the unapproachable and maladjusted Claudia inhabits the same area. On the verge of a breakdown, she s forced to accept a job as an aide for the 100-year-old Baron at the manor. Here Claudia discovers Inge s forgotten diary, a tale of thousands of young men that sacrificed their lives in a pointless war. 1864 is the story of Denmark erupting into war a war that would become one of the bloodiest in Danish history. The story of thousands of young Danish soldiers thrown to the lions when the Prussian army decimated the Danish troops at the Battle of Dybbøl in 1864.